In the IT Realm of today’s companies, one of the biggest areas of discussion is BYOD (Bring Your Own Device) Policies. The main cause for this is the increased presentation capabilities of the mobile devices of todays market. Much, much more can be done with a mobile device of today than one of 4-5 years ago. Please see below for the Top 10 reasons why your conference rooms need a wireless presentation system. Get Rid Of The Ugly Cables – There is nothing worst than having a beautifully designed conference room, only to have the audio-visual system stick out like a sore thumb. You do not want to bring guests, clients, or vendors into your conference room and have a big mess of cables sitting on the table. Your AV system should be in the background, quietly running, and making your presentations beautiful. A wireless system design makes your room look more elegant, makes your company appear more presentable, and makes the conference room users more comfortable in your rooms. Make Your System Easy To Use – Don’t make your conference room users have to run around, sweat, and stress out, trying to find the right cable and get their computers connected to the display. Giving a presentation in front of a crowd is hard enough, and not everyone is good at giving a presentation. With the wireless presentation system, the user can walk in the room, connect to the network, launch the software, and immediately begin their presentation. Free Up Your IT Department – We work with the IT departments of most of our major clients. The simple fact is, that most of the time the IT department is tasked with setting up and managing the audio-visual systems for the company. They get bombarded day after day with requests to come and set up a room, prior to a meeting, because the users are so fearful of something going wrong. Our wireless presentation system can be deployed into your system so effortlessly, that your IT administrators will have more time to do their job and spend less time managing the AV. 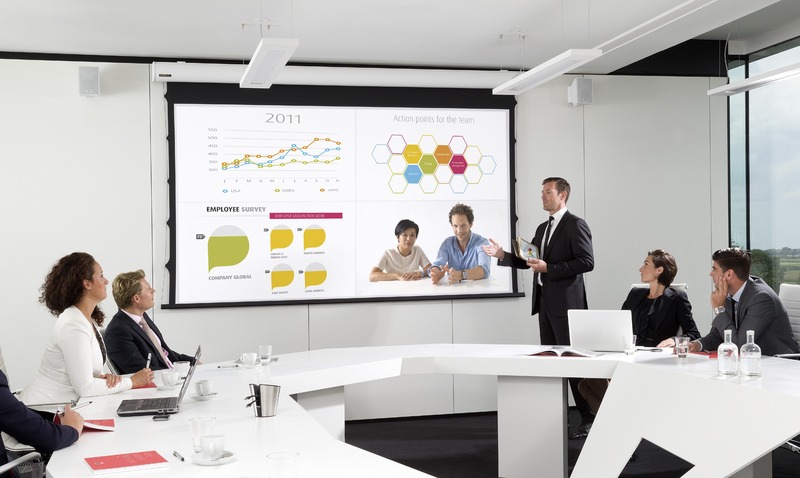 Create Seamless Multi-User Collaborative Meetings – One of the great benefits of utilizing the wireless interactive presentation system in your meeting rooms, is because of the keyword: interactive. Our cable-free presentation device allows up to 64 users to simultaneously connect and give a seamless, collaborative presentation or have an open-forum discussion. Once all the users are connected to the network and have launched the wireless presentation system’s software, they can take turns giving a presentation on the display with a simple press of the mouse. One click and they’re instantaneously on the screen. Allow Presentations From Any Device – In the mobile-centric world that we now work in, our meeting room and conference room environments have changed dramatically. The days of everyone having the same laptop and VGA connection to give a presentation are over. These days, the audio video systems in your conference rooms must cater to not only traditional laptops with VGA connections, but Macbooks, iPads, iPhones, Android phones, and other tablet PC’s. Our wireless presentation system solves all of this with one simple device. No matter what device you use to give a presentation, it will work. Mobilize An Entire Salesforce with A Cutting-Edge Sales Tool – The wireless presentation system is not JUST for permanent installations. This can be a great weapon in the hands of your salesforce. Lightweight and easy to use, the mobile version that we offer of our wireless device is perfect for the salesperson on the road. With its unique carrying case, your salesforce can walk into any office armed with nothing more than the mobile wireless presentation device and a powerpoint presentation loaded on their iPhone or iPad and be able to give a presentation on any television or projector at the potential client’s office. This gives your salesforce an edge over the competition who will come in unprepared and hope they can connect to the client’s system. Create Mini-Meeting Rooms in Executive Offices – We see a lot of the wireless presentation devices get installed behind a TV in the executive offices. This allows the executives of the company to hold private and confident meeting in their own offices, with the same cutting-edge and easy to use system. Enhance Your Training Rooms – The wireless presentation system also has a feature built into the software that allows any user to log in and watch the presentation from their browser. This helps in the larger training rooms, when someone is sitting at the back of the room and cannot quite see the projection screen (or the print on the screen). Now no matter where your training room participants are seated, they still get the full effect of the presentation. Keep Your Company Current On Technology – Times change quickly and nothing changes more quickly than the audio and video industry. You make an investment in technology for your company and then it is time to replace that technology before you know it. The wireless device is great in that it allows your AV systems and meeting room systems to adapt to the changes. Because the device works with any laptop or mobile device, your staff can still be productive no matter what computer they use or even if your company navigates to a BYOD policy. Cost-Effective Solution Allows For More Meeting Rooms – This is a really BIG reason that your company needs a wireless interactive presentation device, which is why we saved it for last. The wireless device is a small, cost-effective, and flexible solution. It will integrate into your full-scale audio-visual systems in your larger conference rooms, executive boardrooms, and training rooms with ease, but the cost-effectiveness of the device is VERY important. Now, you are not limited to having just 2-3 expensive conference rooms that everyone must share. You can turn any small room into an effective meeting room with just a flat-screen TV and our wireless presentation system mounted behind the TV. This opens up your possibilities and gives you the ability to have a number of smaller meeting rooms for those quick impromptu meetings, saving the larger more-expensive conference rooms for your big clients. Thank you for stopping by the Western Audio Visual Blog Page. If you are interested in hearing more about Wireless Presentation Systems, please give us a call at (714) 637 – 7272 and mention the blog!